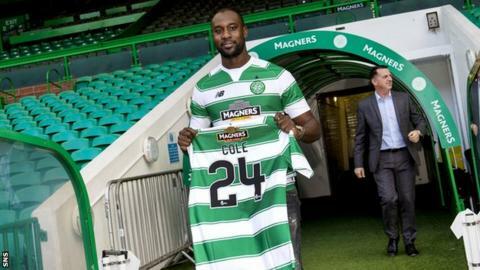 Carlton Cole turned down offers from other clubs to sign for Celtic, saying the decision was a "no brainer". The former West Ham striker, 32, was a free agent and attracted interest from England and abroad, but opted for Celtic because of the size of the club. Cole, who has seven England caps, is also keen to add further honours to his career and win trophies with the Scottish champions. "When Celtic called and said they wanted me, I just ran over," Cole said. "Being at Celtic is not about the money, it's about wearing the shirt with pride. "Celtic are in a great position to win trophies and I want to add that to my career." Cole, who had been training with Celtic in recent weeks, was part of Chelsea's Premier League-winning squad in 2006 and a member of the West Ham side that won the Championship play-off final in 2012. He has been without a club since leaving Upton Park at the end of last season and also attracted interest from the Middle East. Celtic are in Norway to face Molde in Thursday's Europa League Group A match. Cole, who has also played for Wolves and Charlton, will not be available for Celtic's European matches until the new year but could make his debut domestically in the coming weeks. Celtic's ambition to win domestic titles and compete in Europe attracted Cole to Scotland. However, an injury suffered while on trial with the club delayed his signing. He hopes to soon be fit enough to be in contention for selection. "This is my first time living out of London, I haven't [lived] above the Watford gap," the striker explained. "It's been a bit hard for me to try to adjust when I've been anywhere, like when I went to Aston Villa on loan, but I've been up here alone for the last two or three weeks and I've settled in really well. The people of Glasgow are very welcoming and I've had a great rapport from people. "I've already fitted in. The players have taken to me well and I've taken to them. In the changing room there's a great atmosphere and I wanted to be part of that. "[It's] the same I had at West Ham, if you wear that shirt with pride, the fans take to you and you get a good rapport with them. That's what I'm here for. "As soon as I came here, I've had everybody explain to me, including the taxi man, how much the club means to them. That's what I wanted to hear and hopefully I'll be a hero to some." Cole describes himself as a different type of striker to Leigh Griffiths, whose prolific goalscoring has seen him become established as the first-choice striker at Celtic. Deila's preference is a 4-2-3-1 shape, with only one forward, but Cole is confident he can prove his worth and contribute to the team, and he was inspired by the atmosphere he experienced at Celtic Park during the recent 2-2 draw with Fenerbahce in the Europa League. "I'm a different player to Leigh, he's a good, nippy player, scores goals left, right and centre," Cole said. "I see myself as a bit more of a powerhouse, occupying two or three defenders and getting on the end of crosses. I see myself as trying to break open defences when they're tight and locked. "[Ronny Deila] wanted me to be here. He knows it's a big move for me, moving away from my family to another country. I see it as a great opportunity, to be at such a big club. The staff have been brilliant towards me and I've felt so welcome. "The Fenerbahce game was massive and that's the first I've seen it roaring. The fans and the passion, they're the 12th man really and that's what the club is about so that's why I wanted to signed here."